Looking for a way to create colored glass bottles and mason jars? Why tested two techniques to see which one works best. A few years back, we profiled a new technique to 'dye' clear glass any color. 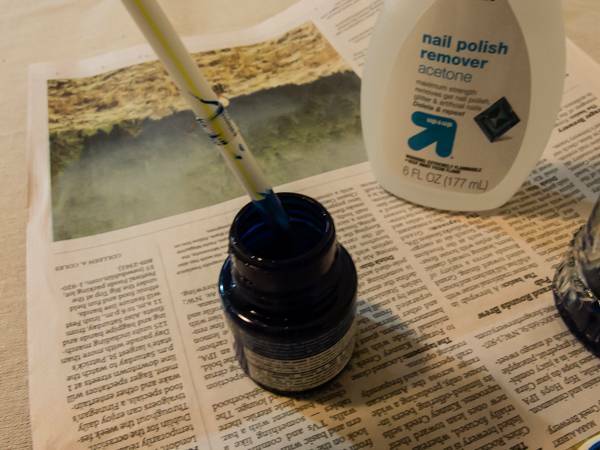 The original maker included instructions that called for mixing acetone (nail polish remover) with Vitrail glass paint. Since posting the profile of the technique, the original how-to has vanished from the internets. We decided to take our own stab at the technique to see if we could replicate the outcome and devise our own how-to. With some trial and error, we were able to do it...but not without some surprises. We'll start with the original technique, which utilized acetone. 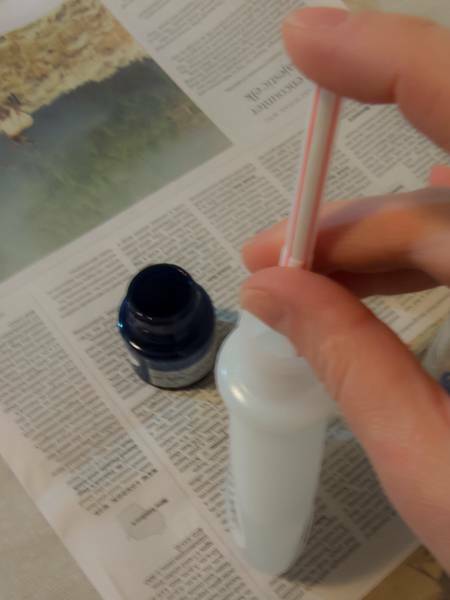 Using another clean straw, draw up some acetone using the finger-over-the-end-of-the-straw trick. Put in about 1/2 as much acetone as paint. Again, ONLY put the acetone at the very bottom of the jar--not on the sides of the jar. Don't forget to read Curbly's Bottle Cutter Shoot-Out to find the perfect cutter for your painted bottles and jars! Use another straw to mix the acetone and paint. Mix it WELL. When the paint and acetone are completely mixed, rotate the jar on its side to swirl the paint, thereby painting the inside of the jar. First surprise. Acetone does NOT mix with the Vitrail. Now, although this was a complete fail, the outcome is really cool. It looks kind of like a static lava lamp. Now let's try the other technique, this time using the Vitrail Lightening Medium. Using another clean straw, dribble lightening medium into the paint. Remember, ONLY put the lightening medium at the very bottom of the jar--not on the sides of the jar. Using the finger-over-the-end-of-the-straw trick works for the lightening medium as well. Use a straw to mix the lightening medium and paint. Mix it WELL. 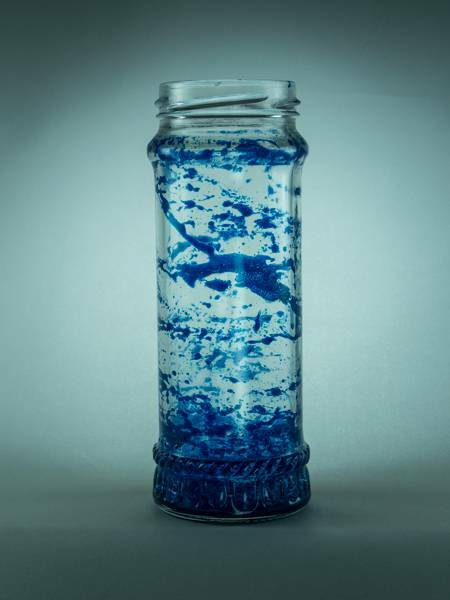 When the paint and lightening medium are properly mixed, rotate the jar on its side to swirl the paint, thereby painting the inside of the jar. As you can see from the picture, the lightening medium and paint mix perfectly, as expected. (They are meant to mix after all.) The mixture is much more viscous than the paint/acetone mix, which means the paint will flow slowly, meaning you'll have to rotate slowly to coat the entire inside of the jar. 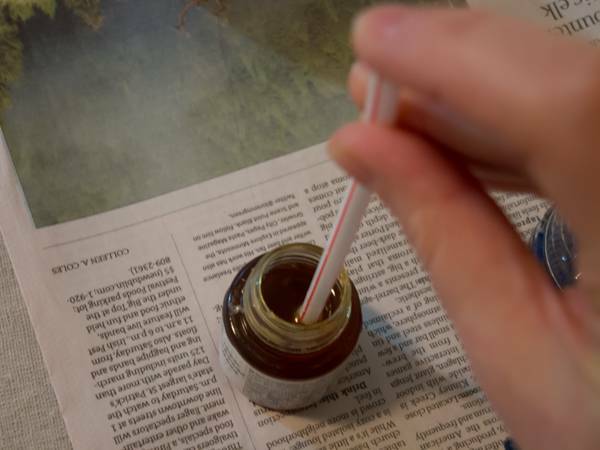 When the jar is completely coated with paint, prop it up on a couple of straws so the paint will drip out of the jar completely and help it dry faster. OKAY, now for the final test. The original tutorial claimed the Vitrail and acetone combo was waterproof. Sadly, it is not. After letting a jar dry for 48 hours, I poured water into it and let it sit for about an hour--a much shorter time than you'd keep flowers in a vase. Oops. 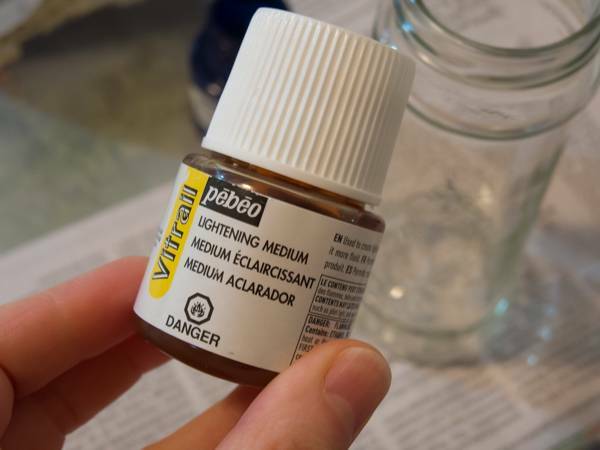 Now, before we dismiss the fixative property of Vitrail, keep in mind that Vitrail glass paint is WATER-RESISTANT, which, technically speaking, means it's "able to resist the penetration of water to some degree but not entirely." That means NO jars that are painted on the INSIDE with either of these techniques using Vitrail glass paint can be used as vases. Sorry folks. That being said, they'd be lovely for candle holders or simply objets d'art. @Des, you have to be careful, the vitrail is for decorating. Once bake it becomes somewhat resistant. Vitrae is actually more resistant, even washable. They are both from Level. Pebeo Vitrail should not be shaken, it needs to be stirred gently & thoroughly. It is highly pigmented which is why you mix it with the Lightening fluid made for adjusting the color and acting as an extender. There is another Pebeo product called Porcelaine which comes in opaque & transparent colors which can be baked for permanence. You don't bake Vitrail because it is oil based & lightening fluid is a solvent. @Vikki I have seen this video before, and the lady in the video painted the glass on the OUTSIDE. On this site they are trying to tint on the inside. One of those paints cannot be baked due to its flammable properties; I can't remember which one.